If how long does it take to completely charge is a huge deciding factor when buying a smartphone, then you will take the iPhone 7 Plus out of your wish list. 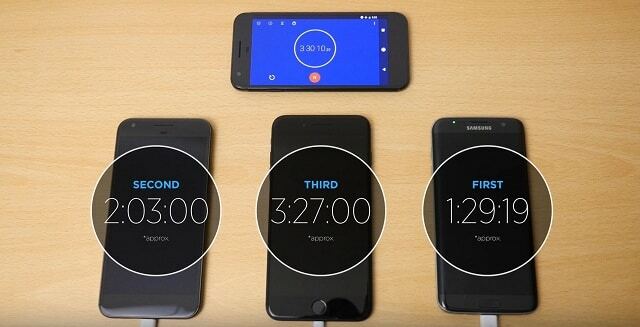 In a test conducted by YouTuber SuperSaf TV, the iPhone 7 Plus, Google Pixel XL, and the Galaxy S7 Edge were put together to find out which of the three devices take the least amount of time to fully charge. The concluded results are very surprising and depressive for a device on the list, even though it had the advantage of having the smallest battery. To make the test fair for each device, SuperSaf used the original charging cable and power adapter of the devices and put each phone on Airplane mode. The test started with each device being charged to one percent, to make the test fair for the iPhone. After charging each device for half an hour, the iPhone 7 Plus starts losing by only being charged at 18 percent, followed by the Pixel XL with 24 percent of charge. At this point, the Galaxy S7 Edge takes the lead by huge marks at 46 percent. As of the concluded results of the test, the iPhone 7 Plus did not look that good. It took three hours and 27 minutes for the iPhone 7 Plus to fully charge, while it only took 1 hour and twenty nine minutes for the Galaxy S7 to fully charge as well. The Pixel XL was in the middle of its two competitors by competently getting charged on 2 hours and three minutes.